Some black mold in buildings arrived on the framing lumber and is harmless both to humans and to the building materials on which it is found. 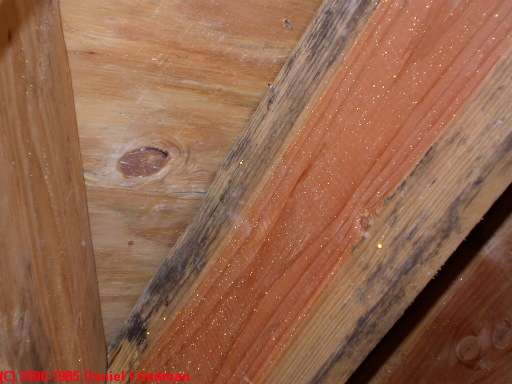 Often a visual inspection for certain clues (discussed below) can make you very confident of when mold appeared on lumber and what sort it probably is. Because some clients have on occasion sent samples to our lab that really should not have been collected, much less looked-at, we provide this library of photographs harmless indoor mold and of things that are "not mold" and don't need to be tested. In many cases these are substances that you can easily learn to recognize in buildings by simple visual inspection of the mold and its abutting and surrounding surfaces. Save your mold test money, and increase the accuracy of your mold contamination inspection or test for toxic or allergenic mold in buildings: review these items to learn recognize non-fungal materials or even possibly harmless cosmetic "black mold" often mistaken for "toxic fungal growth." Also see Recognize Cosmetic Mold, and see our online mold photographic library of what black mold looks like in buildings, located at Black Mold. "Sapstain" fungi are molds that grow principally on or in sapwood. There are three groups of sap-stain molds commonly discussed in the literature. Some literature also refers to "bluestain" fungi that is just about the same grouping. What are sapwood and heartwood anyway? 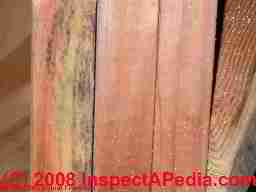 Sapwood forms the main portion of a tree while heartwood is found only at the center of the tree. Most building framing lumber is almost entirely sapwood. Dematiaceous molds (this just means molds whose spores appear dark or "black") including the two most common mold genera on earth, Cladosporium sp. (the "king of molds"), and Alternaria sp. (A runner-up for mold king based on frequency of occurrence). 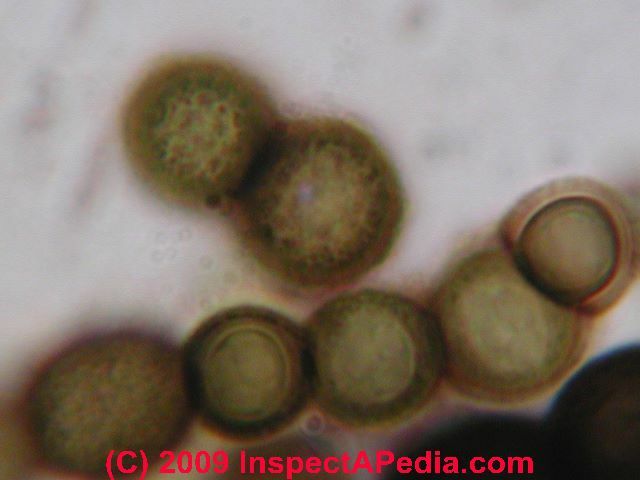 Black yeasts, a sub-group of the mold family that include two very common molds Aureobasidium sp. (often found in moist attics on plywood as well as on wood framing), and Rhinocladiella (less often found in buildings). Our photo at left shows a closeup of Aureobasidium sp. under the microscope. More mold microphotos can be seen at MOLD BY MICROSCOPE, and photographs of common molds found in buildings can be seen at MOLD APPEARANCE - WHAT MOLD LOOKS LIKE. 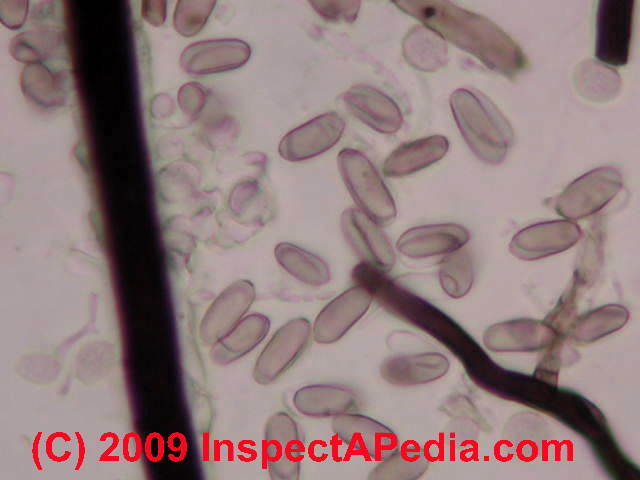 Ophistomoid fungi, a group that includes Ceratocystis sp. and Ophistoma sp., and related fungi - these are the most common cosmetic black molds found on framing lumber and sometimes on plywood, and are the main subject of this article - see our page top photo as well as more photographs below. Because it is difficult in the lab to distinguish between Ceratocystis sp. and Ophistoma sp. by microscopic examination, and because these are not problem molds, most labs combine and report these fungi in lab samples as either Ophistomoid fungi, or as Ceratocystis/Ophistoma group fungi. Watch out: building materials with cosmetic mold on them can also support growth of other problem mold species if later conditions are right for new mold growth. Many of our lumberyard samples of mold on wood examined in our own study of this phenomenon, especially samples collected from (wet) pressure-treated lumber contained both harmless cosmetic molds and an overgrowth of potentially harmful molds including mostly Penicillium sp. and some Aspergillus sp. So inspect "cosmetic" mold growth areas carefully using good lighting techniques - see FLASHLIGHT HELPS FIND MOLD for details. Make sure that the obvious harmless "black mold" you see (such as shown in the photograph at left) is the only mold growth found. As we describe later in this article at What to do about Cosmetic Molds on Indoor Building Surfaces, while most cosmetic mold can simply be left alone, we suggest that you do not assume that just because wood is obviously stained with cosmetic mold, that no harmful molds are present, particularly where damp, wet, or treated lumber is involved. Other fungi may also be present, so a closer look might be appropriate. But if the mold growth is interrupted, it almost certainly was on the lumber at time of construction and is unlikely to represent an active building mold problem. That does not mean there could not be some other indoor mold problem, but if your mold looks like the photo on the rafter in the left of the photo just below, you are not looking at active building mold growth. Cosmetic molds, such as the Ceratocystis sp./Ophistoma sp. group of Ascomycetes are not likely to be harmful to people nor to the wood they're found on. 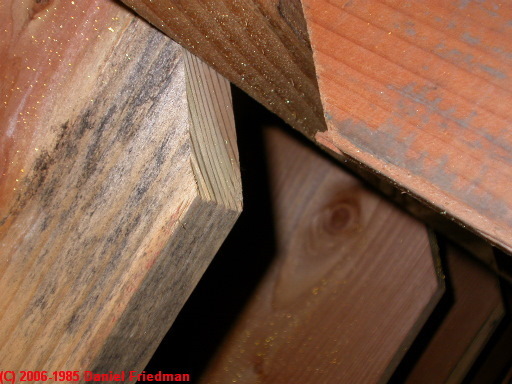 In these photographs of black mold on building framing you can see that the black mold "stops suddenly" at the cut end of a rafter (photo at left) and where a rafter meets the roof sheathing. Incidentally, that light brown material on the rafter in the upper right of our photo (left) is mud from construction, not mold. "Interrupted" mold growth in this pattern forms unambiguous and compelling evidence that this mold was on the particular rafter at the time of construction. You can see the interrupted black mold growth on framing lumber in our photo at left as well as the two black mold on wood framing photographs above on this page. Other dark growths that may look "black" on wood surfaces include black yeasts such as Aureobasidium, often A. pullulans, as well as some of the most common species of Cladosporium sp.and Alternaria sp., some of the more common dark molds that we find on plywood roof decking in attics and on occasion on rafters. You can see photographs of these other dark post-construction attic molds at ATTIC MOLD, WHAT IT LOOKS LIKE. But the dominant "black mold" found on framing lumber at the lumber yard and in new construction, as well as remaining in homes after construction have been completed are the ophistomoids Ceratocystis and Ophistoma, whereas Aureobasidium sp. and Cladosporium sp. are more likely to have developed on a building surface after construction. "Pressure Treated lumber" which is sold as resistant to rot and resistant to wood destroying insects is very often not only wet when purchased, but is often mold contaminated with several species of Penicillium sp. or Aspergillus sp. 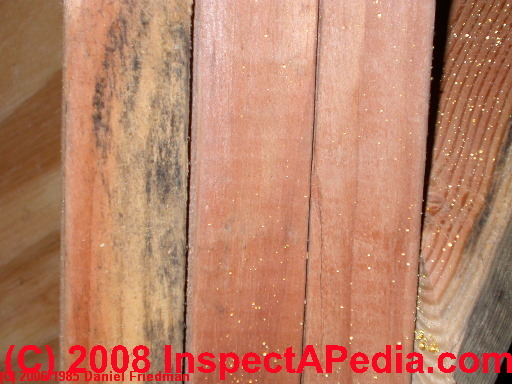 We confirmed this condition by a survey of building materials at several lumber suppliers in New York, using tape samples of visible mold on the surfaces of these products as well as by testing framing lumber found at active building sites (photo at left and others on this page). Various sources have reported that Ophiostoma grows in culture on media that contains cycloheximides, an agricultural fungicide that inhibits protein synthesis, so it is plausible to pose that it may have grown on wet treated lumber after the wood was processed with fungicides intended to prevent insect attack. It's ironic that treatment to prevent termite or carpenter attack on framing lumber appears to actually increase the growth of these molds on the same product. We also found that sometimes "green" pressure-treated lumber, often Southern yellow pine (SYP), contained both cosmetic black molds (described above) and additional Penicillium sp. or Aspergillus sp. We don't know if the latter molds appeared later in the life of the lumber, perhaps parasitically on top of existing biological materials, but there was no doubt that it was present on new pressure treated wood which we examined both at building supply houses and at some building sites. An example of a parasitic mold commonly found growing on the ophistomoids is Gonadobotryium sp. Here's another example showing that a single pre-moldy-2x joist was used to make a built-up basement beam. 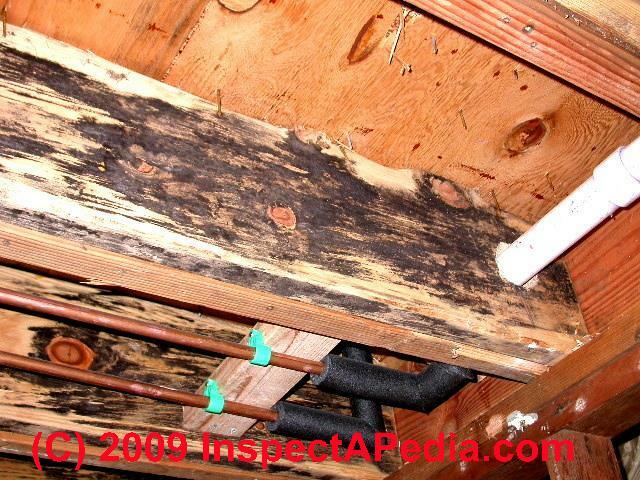 See this photo of black mold on a built-up wooden girder or beam? Mold is visible on only one of three 2x12s? This is not live mold growing in the attic nor basement. A microscopic examination confirmed that these surfaces were Ceratocystis/Ophistoma. 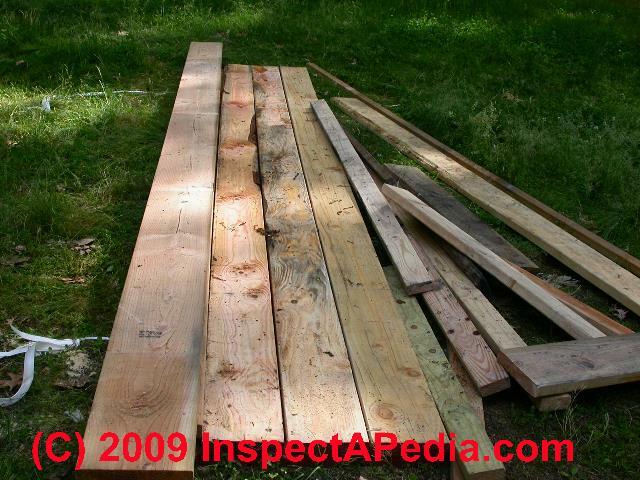 If you are reasonably sure that you’ve got mold like Ceratocystis/Ophistoma that came in on the lumber at time of framing, it’s harmless and also is not likely to grow into a bigger problem. In fact indoors we have never found Ceratocystis/Ophistoma mold in an active growth state inside of a building – we imagine that it needs different (wetter) growing conditions than found in a building. Indoors, even if Ceratocystis/Ophistoma mold was alive, it’s cosmetic-only. Cleaning or removal of a cosmetic mold is entirely optional and would be done (or not) in a building for reasons of appearance, not health. If the cosmetic mold you see is like that in our photographs on this page, that is, there is no evidence of active mold growth and the mold obviously came from the lumber yard and the lumber is dry, or kiln-dried, and the environment where the wood is found has remained dry, the mold is only cosmetic and no action is necessary. This step is not necessary and would be inappropriate for the same lumber when used outdoors, such as for a deck or an entry stair. But inside, such lumber may be used for sill plates or in some cases we have seen it used to re-frame a rotted floor over a wet crawl space. Importing a large Aspergillus sp. colony on the floor framing surface over a crawl space provided an immediately-detectable high level of airborne Aspergillus sp. in the room above this area, as these spores move easily in convection air currents moving from the crawl area up through the building. For this reason, if visibly moldy treated lumber is to be used in indoor construction we recommend that it be physically cleaned first - such as by using a power washer and deck cleaning solution. "Sterilizing" such lumber to try to "kill" mold is unnecessary and inappropriate. ANY indoor building condition that produces or has produced new or recurrent indoor mold growth on building surfaces means there is also a risk of both visible and hidden problematic molds of genera/species other than just cosmetic molds. Even when you test and identify a specific mold on a building surface you should not assume that the mold you've identified is the only problem, or even the most serious mold problem in the building, unless you have also completed a through, expert diagnostic inspection of the building.